The Battle of Kohima took place in North East India, close to the Burmese border, between 4th April and 22nd June 1944. A major turning point in the war, it marked the limit of the Japanese advance into India. It was also one of the few occasions when British and Japanese troops engaged directly. 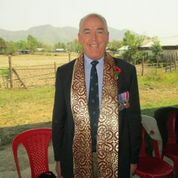 However, despite the fact that the Kohima Epitaph is said at every Remembrance Service in the UK and at each repatriation of a fallen British soldier from modern battlefields, there is very little public knowledge about the Burma Campaign of WWII. As we celebrate the 70th anniversary of the end of WWII, this presentation will give an overview of this little-known battle and its aftermath.